Scientists from the Diabetes Research Institute at the University of Miami Miller School of Medicine (Miami) have confirmed the existence of progenitor cells within the human pancreas that can be stimulated to develop into glucose-responsive beta cells. These findings open the door to developing regenerative cell therapies for those living with type 1 diabetes, addressing a major challenge that stands in the way of discovering a biological cure for the disease. regenerate islets has been hypothesized for decades, but not conclusively demonstrated. DRI scientists have now been able to identify the exact anatomic location of these stem cells and validate their proliferative potential and ability to turn into glucose-responsive beta cells. “Our in-depth study of these pancreatic stem cells may help us tap into an endogenous cell supply ‘bank’ for beta cell regeneration purposes and, in the future, lead to therapeutic applications for people living with type 1 diabetes,” said Juan Dominguez-Bendala, Ph.D., DRI director of pancreatic stem cell development for translational research and co-principal investigator of the study alongside Ricardo Pastori, Ph.D., director of molecular biology. “Together with our previous findings using BMP-7 to stimulate their growth, we believe that we may be able to induce these stem cells to become functional islets." The DRI team previously reported that bone morphogenetic protein 7 (BMP-7), a naturally occurring growth factor already approved by the Food and Drug Administration (FDA) for clinical use, stimulates progenitor-like cells within cultured human non-endocrine pancreatic tissue. 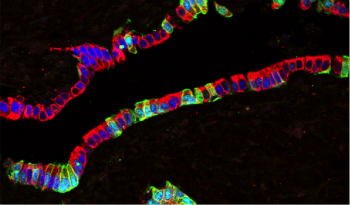 In the most recent study, published in Cell Reports, the researchers went on to demonstrate that those stem cells that respond to BMP-7 reside within the pancreatic ductal and glandular network of the organ. Additionally, the cells are characterized by the expression of PDX1, a protein necessary for beta cell development, and ALK3, a cell surface receptor that has been associated with the regeneration of multiple tissues. Using “molecular fishing” techniques, they were able to selectively extract the cells that expressed PDX1 and ALK3, grow them in a dish and demonstrate that they can proliferate in the presence of BMP-7 and later differentiate into beta cells. Together, the combined study results may help move researchers closer to developing regenerative cell therapies for type 1, and potentially type 2, diabetes. In type 1 diabetes, the insulin-producing cells of the pancreas have been mistakenly destroyed by the immune system, requiring patients to manage their blood sugar levels through a daily regimen of insulin therapy. In type 2 diabetes, patients are able to produce some insulin, but their beta cells may become dysfunctional over time. Islet transplantation has allowed some patients with type 1 diabetes to live without the need for insulin injections after receiving infusions of donor cells; however there are not enough cells to treat the millions of patients who can benefit. Thus far, research efforts have focused primarily on creating more pancreatic cells for transplant from sources like embryonic (hESc), pluripotent (hPSc) and adult stem cells, and porcine (pig) islets, among others. A more efficient and potentially safer solution could lie in regenerating a patient’s own insulin-producing cells, sidestepping the need to transplant donor tissue altogether and eliminating other immune-related roadblocks. Human pancreatic section showing the epithelium of a large pancreatic duct harboring progenitor-like cells. These cells are characterized by expression of PDX1 (white) and the BMP-7 receptor ALK3 (red), but not the ductal marker carbonic anhydrase II (CAII, green). When sorted and cultured in defined conditions, these cells are BMP-7-expandable and exhibit multipotent differentiation potential. Image courtesy of DRI.